The map was self-published by Gomberg and offered for sale for $1 in magazines such as American Teacher in 1942 and Survey Graphic in 1944. 2. 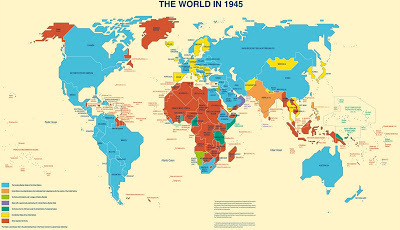 The old world order of colonial oppression, exploitation of dominions, rival imperialism and mercenary balance of power diplomacy; of majesties, dictators, privileged minorities, plutocratic monopolists and similar social parasites; the corrupted order responsible for the present world cataclysm, endangering our national safety and peaceful process, shall never rise again. 3. A New World Moral Order for permanent peace and freedom shall be established at the successful conclusion of the present war. 4. For reasons of history, economic structure, favorable geography and the welfare of mankind, the U.S.A. must, altruistically, assume the leadership of the newly established, democratic world order. 5. To reduce the burden and criminal waste of armaments expenditures everywhere in the world, the U.S.A., with the cooperation of Latin-America, the British Commonwealth of Nations, and the U.S.S.R. shall undertake to guarantee peace to the nations which will be permanently disarmed and demilitarized after the conclusion of the present war. 6. In order to be able, in the fulfillment of our obligations, to effectively prevent the possibility of a recurrence of another world cataclysm, the invincibility of the U.S.A. as a military, naval and air power, shall be the major prerequisite. 7. For realistic considerations of strategy and our invulnerability, it is imperative that the U.S.A. shall obtain relinquishment of controls of their possessions from all foreign Powers in the entire Western Hemisphere, it’s surrounding waters and strategic island outposts as outlined on accompanying map. 8. For considerations of hemispheric defense and in the spirit and tradition of the new Monroe Doctrine of hemispheric solidarity and the “Good Neighbor” policy, the U.S.A. with the consent of the Latin-American Republics, shall obtain control and protectorate rights of the relinquished territories. 9. To strengthen our position in the Caribbean area which is of obvious importance to hemispheric defense, all possible inducements shall be offered to our neighbors of Central America and the West Indies to facilitate their entrance as equal states of the U.S.A. as outlined on map. 11. The liberated British, French and Netherlands Guiana shall be reorganized as one state of the U.S.S.A. 12. All Powers shall relinquish their controls of their colonial, mandate and strategic island possessions everywhere in the world. 13. 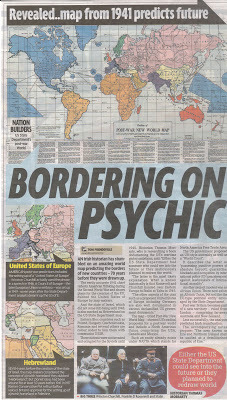 The British Commonwealth of Nations, the second military and naval Power of importance cooperating in a binding compact with the U.S.A. as a Power for freedom, shall retain and acquire control such territories, peace-security bases and strategic islands outposts essential for the maintenance of world peace and freedom as outlines on the map. 14. The U.S.S.R., the third military Power of importance cooperating with the U.S.A. as a Power for freedom and the maintenance of world peace, shall acquire control of the liberated, disorganized adjacent areas and those of Germany-Austria to be re-educated and eventually incorporated as equal republics of the U.S.S.R., as approximately outlined on map. 15. A world League of Nationalities with arbitration and supervision powers shall be organized. 16. A World Court with punitive powers of absolute boycott, quarantine, blockade and occupation by international police, against lawbreakers of international morality shall be organized. 17. 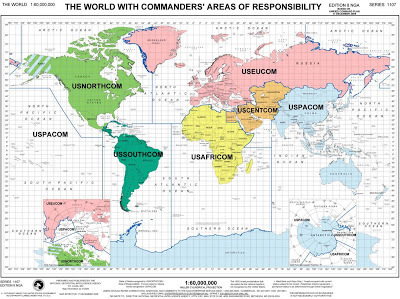 The U.S.A. with the close cooperation of the United States of South America, the British Commonwealth of Nations, the U.S.S.R. and the World League of Nationalities, shall promote and assist in the unification of the relinquished territories and the areas at present unsoundly divided into well organized democratic and absolutely demilitarized republics as approximately on the map. 27. The area known as European Turkey, adjacent to the Dardanelles, sea of Marmora and Bosporus, for considerations of realistic peace strategy shall be placed under joint control of the U.S.S.R. and Turkey. 29. All problems of exchange, transfer and repatriation of populations shall be administered by the World League of Nationalities. 30. The criminal perpetrators and their partners in guilt of this hideous war shall be brought to justice and unforgettable punishment administered. 31. All subjects of Japan and all persons of Japanese origin of doubtful loyalty shall be expelled from the entire Western Hemisphere, U.S.A. protectorates and strategic island outposts and their property confiscated for post-war reconstruction needs. 32. All subjects of Germany and Italy and all persons of German and Italian origin known as active supporters of Nazi and fascist ideologies shall be treated similarly. 33. German, Italian, Japanese immigration to the Western Hemisphere, its protectorates and island outposts shall be indefinitely stopped. 34. All persons of German origin in East Prussia and the Rhineland shall be transferred to inner Germany and the regions permanently de-Prussianized. 35. All persons of German, Italian and Japanese origin shall be permanently expelled from their now conquered territories and their property confiscated for post-war construction needs. 36. To cleanse the populations of the defeated Axis aggressors of the intoxication of military chauvinism; to effectuate the removal and destruction of their potential military establishments; to recover the accumulated loot and to re-educate them for their eventual membership in the Family of Nations, the areas of Germany-Austria, Italy and Japan shall be hermetically and indefinitely quarantined and administered by appointed Governors subject to supervision by the world League of Nationalities. 37. All resources, industrial and labor capacity of quarantined areas shall be employed for the post war restoration and reconstruction needs. 38. To reduce the numerical power of the aggressor nations, as a potential military advantage, a Population Control Policy shall be elaborated and applied in the quarantined area. 40. To retain the victory and leadership of our united democratic effort….the aim of which is not vengeance or exploitation, but freedom and security to all nations for peaceful progress….the unified “Supreme War Command of the United Nations” at the conclusion of the present war, shall be recognized and transformed into a permanent “Supreme Military and Economic Council” collaborating with the World League of Nationalities in post war construction and to enforce world peace. 41. The “Supreme Military and Economic Council” shall appoint the Governors to administer the quarantined areas until their eventual parole. 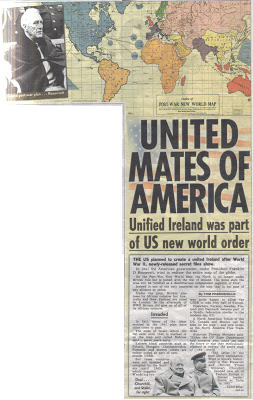 Smaller entities include Eire (the whole of Ireland), Greece (including Albania), Turkey (excluding European Turkey), Hebrewland (the Holy Land plus Jordan) and Japan. The three axis states (Germany, Italy and Japan) were to be ‘quarantained’ until they could be readmitted in the family of nations. 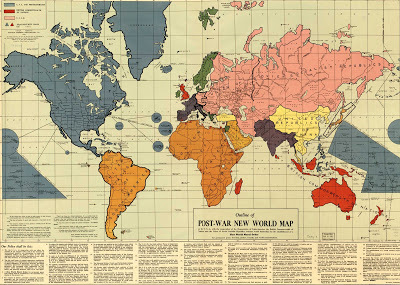 http://the-gomberg-map-of-world-union.blogspot.com/ – A WORLD WITHOUT CANADA. See the page "World Law".